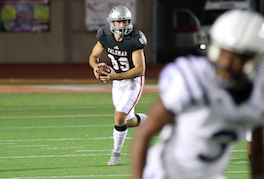 ESCONDIDO (11-03-2018) – Palomar couldn’t have picked a better time to put together its best all-around football performance of the season Saturday night as quarterback Connor Curry unloaded on state No. 12-ranked Cerritos College. He got plenty of help from his teammates and, as he pointed out, his coaches, against the visiting Falcons in an SCFA National Division Central League game. Curry connected on 24-of-37 pass attempts for 360 yards and five touchdowns, and added 50 yards and a sixth TD rushing on eight carries, as Palomar won 45-35 at Escondido High School’s Chick Embrey Field at Wilson Stadium. The Comets rolled up 506 yards in total offense and took a giant step toward a berth in the four-team Southern California playoffs or at least a good bowl game on a night San Diego County’s other three community college teams lost. 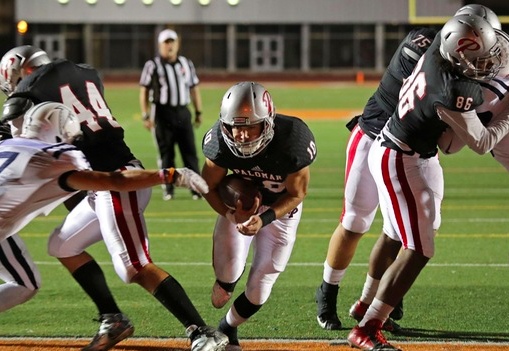 (Palomar became bowl-eligible Saturday with its fifth win of the season). “Our offensive line (6-foot-3, 340-pound left tackle Quinton Maxwell; 6-4, 300-pound left guard Francisco Rodriguez; 6-2, 240-pound center Anthony Escalante; 6-6, 290-pound right guard Braydon Lindholm; 6-6, 290-pound right tackle Will Eoff; and 6-4, 230-pound tight end William Gonzalez) did a great job blocking. Our line came of age tonight,” Curry said. Then, of course, there was Curry himself. The redshirt freshman connected on touchdown passes of 58 yards to Malachi Russell after the Comets drove down with the game’s opening kickoff, 21 yards to Logan Gamble, 33 yards to Mikel Barkley, 33 yards again to Barkley and 24 yards to Lamar Raboteau. Then he scored from 1 yard out himself on a TD Shevell Sterling set up with a 47-yard run. Jacob Vose put the icing on the take with a 35-yard field goal with 4:06 to play in the game that was set up by Curry’s 14-yard completion to Devin Nilson, his 41-yard completion to Russell and his 13-yard completion to Barkley. Defensively, the Comets became the first team all season to slow Cerritos’ 6-foot-1, 230-pound sophomore running back Rhamondre Stevenson, out of Centennial High School in Las Vegas, who leads the nation’s community colleges in almost every category and is being recruited heavily by SEC schools and other national powers. Stevenson was averaging 11.4 yards per carry going into Saturday’s game and was held by the Comets to 158 yards rushing and one TD on 20 carries, well under his normal output, along with two receptions for 71 yards. On the season, Stevenson is still averaging 9.9 yards per carry and 190.0 yards per game to lead the nation and 14 touchdowns, all to lead the nation. By comparison, the leading rusher in the NJCAA (non-California and Washington community colleges), Jaylen Warren of Snow College in Utah, is averaging 9.6 yards per carry, 162.6 yards per game and has scored 10 TDs. “(Stevenson) is a great running back. You don’t stop him, you can only slow him down a little, and we did that and we won,” Joe Early said. Leading Palomar’s defensive performance: Josh Bernard (11 tackles, 1 quarterback hurry), Spencer Kaoanga (11 tackles), Chris Calhoun (10 tackles, tackle for loss, quarterback) and Orion Diaz (two big interceptions).